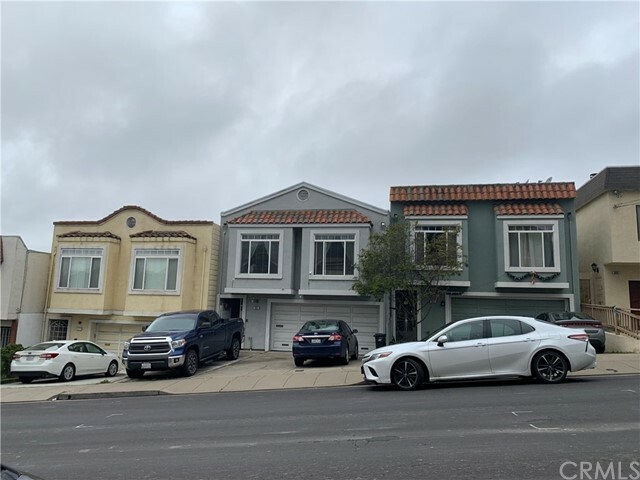 All Daly City homes currently listed for sale in Daly City as of 04/19/2019 are shown below. You can change the search criteria at any time by pressing the 'Change Search' button below. If you have any questions or you would like more information about any Daly City homes for sale or other Daly City real estate, please contact us and one of our knowledgeable Daly City REALTORS® would be pleased to assist you. "Great location! Welcome to this spectacular home in beautiful city of Daly City. It is 4 bedroom and 3 bathroom. The lower level master bedroom feels a suite. It is near everything from schools to shopping stores for your convenience. Bright nature light coming through windows with beautiful laminate wood floor in the living room. As a bonus there are skylights throughout the house. Electricity is used to the minimum. The low maintenance backyard has fruit trees and lime waiting for you. Excellent location walking distance to public transportation , Shopping and easy access to Colma Bart fwy 280/101, downtown SF , and SFO . This huge home in a huge city, and if your family like the city life, this is a perfect match!" "Stunning views of the Pacific Ocean and San Francisco!!! Abundant natural light fills the home thanks to the large windows throughout. The upper level of the home features a spacious floor plan ideal for daily living and entertaining. The two bedrooms and full bath are nestled together. The beautiful, custom tile work is seen throughout the upper level kitchen, living room, and lower level bathrooms. Enjoy the grand views while enjoying a cup of coffee on the custom deck. The lower level of the home features a permitted unit with a full kitchen, full bathroom, and separate entrance. There is an additional bonus space and bathroom. Recently Updated, Furnace, Water Heater. Ideally located on the Peninsula, the home is close to SFO, 280, Skyline, Hwy 1, and more! Enjoy access to the nearby hiking trails and being minutes from the beach!" "Great location! Semi-detached mix use property next to Walgreens & Mission Plaza Shopping Center in Daly City. A block away from B of A, post office, bus lines & restaurants. Walking distance to Holy Angels School & Parish, TRP Middle School, Susan B. Anthony & Jefferson High School." "This is it, YOUR NEW HOME! Welcome to this wonderfully updated home with beautiful views of the mountains! Boasting numerous upgrades throughout, this amazing property features a bright and open floor plan, brand new exterior and interior designer paint, brand new laminate wood floors, all new recessed lighting throughout, stylishly remodeled bathrooms, and a truly stunning kitchen with new quartz countertops, modern cabinets, and brand new stainless steel appliances. Whatever your lifestyle, this ideal location and distinctive community lets you create a life uniquely you, and this beautiful modern home will ensure that you and your family live the good life for years to come. WELCOME TO YOUR NEW HOME!" "Classic Doelger built home located in one of Daly Citys most desirable neighborhood. 2 Bedrooms / 1 Bathroom upstairs. Both kitchen and bathroom are updated and in move in condition. A nice deck off dining room overlooking serene tree lined yard. Bonus room and full bath downstairs built with the benefit of a permit. Both front and back yard are low maintenance. This home is on a quiet street yet is in between conveniences of Westlake Shops and Ranch 99 Supermarket. Walk to Majorie Tobias Elementary School. Make this home yours today!" "Welcome to 147 Morningside Dr. Brought back to life, this stunning remodel is not to be missed. A Subtle color pallete throughout the home is relaxing, welcoming and elegant. Beautiful, gleaming refinished hardwood floors welcome you into the open living/dining areas with ocean views through dual pane windows! A dream of a kitchen with marble countertops, soft-touch cabinets and drawers, under cabinet lighting, new stainless steel appliances, fantastic deep sink and more. Highly desired with 3 bedrooms and 1 bath on the top level, and, an additional, legal and permitted, 2 bedrooms and 1 bath on the lower level. This home has so much to offer with many thoughtful upgrades and finishes you need to experience for yourself." "Light and bright Broadmoor home situated on a sprawling 7,000+ square foot lot, conveniently located just a short walk from shopping and dining at the Westlake Center, and only 1.5 miles from gorgeous Thornton State Beach. A spacious living room enjoys ample natural light, a wood burning fireplace and large adjacent dining room. The sunny kitchen features brand new range, dishwasher, counter-tops, sink and garbage disposal, plus a small breakfast nook. The master suite enjoys large picture windows, its own access to the backyard, a wet bar, and en suite bathroom. The home enjoys a large back patio bordered by a beautifully landscaped terrace garden, the perfect place to BBQ and entertain guests. From the patio, a walkway leads you to a large open yard with views of San Bruno Mountain. Ample off-street parking provided by an attached 1-car garage, as well as a super-wide driveway which can comfortably park 3 vehicles." "Highly desirable Serramonte, well cared for home available for the first time in 53 years. Pride of ownership in evident throughout offering an open floor plan, gleaming hardwood floors, fresh paint, updated eat in kitchen with stainless steel appliances, granite counters and three good size bedrooms on the main floor. The one bathroom has been updated as well with a spa and steam shower. Downstairs boasts an oversized two car side by side garage and an additional 200 plus sq ft area with access to the backyard making this a perfect opportunity for anyone looking to expand. Some extras include newer water heater, blown in insulation in walls and usable attic, newer driveway and complete cement paving of sides and backyard. Clean, Clean, Clean. Location is within walking distance to shopping, recreation, dining and a secluded park across the street. Minutes away from Skyline Blvd, 280 and Callan Blvd busline." "Sought After Serramonte Sun-Stream Model Home. San Francisco Little Known Neighbor. Located In the Heart of Parks, Shopping, Transportation,Restaurants, beaches and more. Move quickly to make this home yours!" "Location! Location! Location! Walk to Bart, restaurants, shops on Westlake Shopping Center, close to schools, church, and movie theatre, easy freeway access. Needs TLC, 2 bedrooms upstairs with 1 bath, has wood burning fireplace in the family room. Downstairs has bonus 1 bedroom 1 bath and has laundry hookups and one car garage. This house has lots of potential, ready for your own touch, bring your tools and reap the rewards!" "Beautifully remodeled condo in the Civic Center area of Daly City. Every surface has been tastefully remodeled! The gourmet kitchen features Shaker style cabinets, quartz countertops, and brand new stainless steel appliances. The master bathroom boasts a gorgeous vanity with Kovastone quartz countertop, and the shower features white subway tile with Carrara marble accent tile. New carpet in bedrooms and living area, and imported Italian porcelain tile flooring in the kitchen and bathrooms. Excellent location! Bike or walk to the coast; Just a short 3 miles to famous Fort Funston. Near Westlake Shopping Center shops and restaurants. Easy commute to San Francisco, SFO airport and a short drive to OAK airport." "Rarely available! Great opportunity to own a Mission Hills Community Condo. Two Bedroom 1.5 Bath. Overlooks beautiful redwood trees. Peekaboo view of downtown San Francisco from nice sized deck. Update Kitchen with Stainless Appliances, Wood laminate flooring, Washer Dryer in unit. Two Car Parking plus Storage. Pet friendly complex. Daly City is the Gateway to the Peninsula, Minutes to downtown San Francisco. Easy access to BART, public transit, vibrant local Mission district eateries and coffee houses." "This Argyll Plan is one of the most desireable floor plans at Crown Colony with a generous 1065 sq ft of living space. A beautiful corner end unit with 2 master suites divided by an expansive living & dining combo, spacious private deck off living room perfect for lounging or entertaining guests. Interior is freshly painted with elegant crown molding throughout. A renovated kitchen with granite counters, maple cabinets, modern stainless steel appliances & a built-in wine rack makes for great cooking. Each bedroom has its own private bath and double closets for the wardrobe enthusiasts. 1st Open House: Saturday, April 20 from 1-3pm."